Nationals in Red Wing – The Recap! For the 5th time since 1989, the AMA Hillclimb Grand Championship returned to Indianhead Motorcycle Club in Red Wing, MN – a unique motorsports location which has been in use for so long that the city actually grew up around it. Since 1949, IMC has hosted motorcycle hillclimbs in the same exact location…but originally, like most motorsports events, the event grounds were kind of out in the middle of nowhere. In the nearly 70 years that have gone by, though, the city of Red Wing has grown up around IMC’s club grounds, such that it’s practically in the middle of town now – right next door are apartments, family neighborhoods, and the city’s baseball fields and hockey arenas. In fact, the city allows IMC to use the hockey arenas for event parking (they tend not to be used much during the summer anyway). 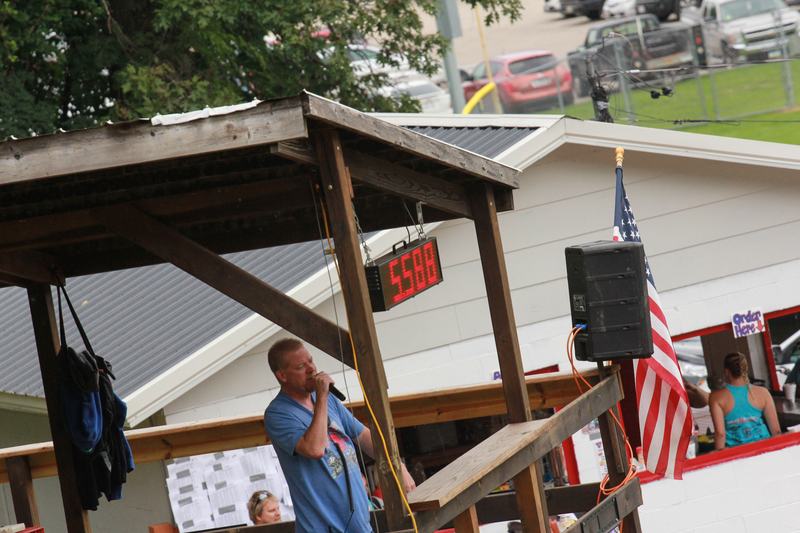 So as a result, some of our neighbors can simply sit in their back yards and watch our events…kids playing outfield may be distracted once in a while by watching our hillclimbs, and baseball fans watching a Red Wing Aces game can kind of keep tabs on our event by listening to our announcer. All in all, it’s a pretty great arrangement, and IMC is proud to have truly become a Red Wing tradition! The last time IMC hosted the national championship event was in 2006 – the event coinciding with Red Wing’s River City Days festival, as it did this year as well. In 2006, there were 372 entries – eleven years later, the entry count was 473 – neatly a hundred additional entries, well more than a 25% increase from the prior event. And with all the riders from across the country came their families, friends, and of course local spectators who turned out in droves to bear witness to the spectacle! This year, IMC went all-out in prepping the hill and the event grounds for this national championship event – backbreaking work went into clearing trees and brush that would obstruct the view in certain locations, the clubhouse/concession stand was totally revamped, a small army of Bobcats swarmed the hill the week beforehand to fully rennovate it, and there was even a video camera mounted at the top of the hill with giant TV monitors mounted on the scoring tower, so that spectators could see the riders launch off the top of the hill from the opposite point of view! Coming into the event weekend, the weather took a dastardly turn…on the Wednesday leading into the event, some forecasts were calling for nearly 2 inches of rain! So IMC actually covered the entire hill in plastic, to ensure that everything would be in tip-top shape for the event. Seeing a 300’ hill totally tarped over is kind of a surreal thing to see…but all the work IMC put into the event really made all the difference in the world on race day – the hill couldn’t possibly have been in better shape, and aside from a couple minor issues the whole weekend went off with great precision and in record time – starting at 8:00AM both days, the regular classes were done by 2:00 – leaving all the time in the world for extras like the Verticross, King of the Hill, and the awards ceremony. But we’re getting ahead of ourselves…the racing on both days started with the ATV classes. 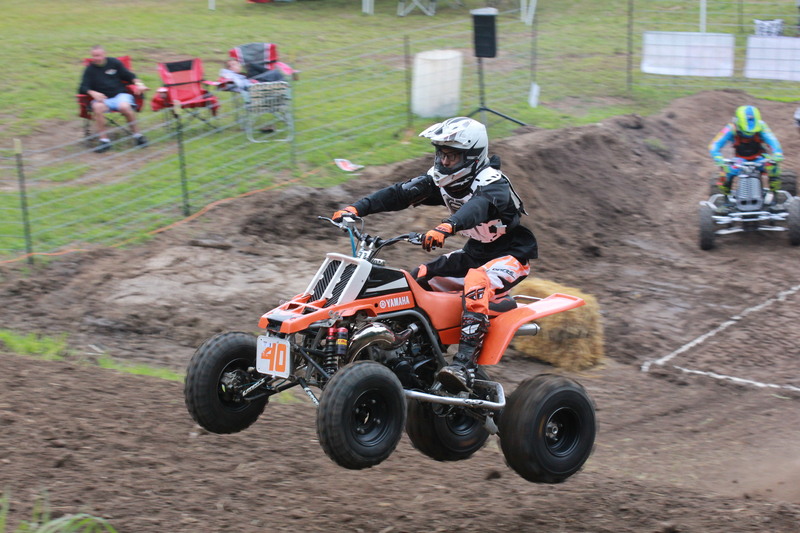 In the ATV 450 class, 6 riders fielded nothing but Yamahas in their assault on the hill, with Zach Diercks of Hager City, WI sitting in the lead spot after Saturday’s action with a smooth 6.856 second run, closely followed by Jason Vanberg of Red Wing at 6.991 – no one else broke into the 6s on the first day. On Sunday though, Vanberg would drop nearly half a second off his time with a 6.590, easily putting him into the lead. Scott Slater of Charleston, WV laid it all on the line and threw down a 6.752 second run, bettering his Saturday time by 6 tenths – in the process crashing over the top of the hill and soundly ringing his bell. We’re grateful that Scott didn’t seem to be seriously injured, but he was done riding for the day after that… Diercks took a swing at Vanberg as well, and bettered his first-round time to a 6.749 – good enough for 2nd, edging out Slater by a miniscule 3 thousandths of a second, as Vanberg claimed the victory. Josh Shafer of Caldwell, OH took home the 4th place trophy, and James Sack of St. Peter, MN rounded out the top 5. 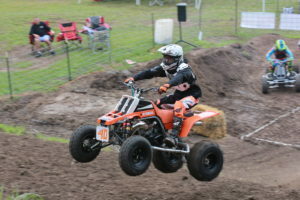 The ATV Open class had 11 entries, including riders from West Virginia, Massachusetts, and Illinois – after the first round, it was Scott Slater standing tall with a nearly-perfect 6.408 run that was only seriously challenged by one other rider, Jimmy Thaxton (also from Charleston, WV) who posted an excellent 6.483-second ride – both riders on Yamahas. 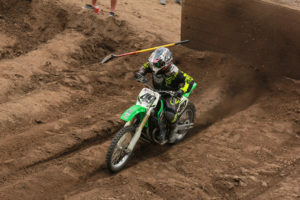 The rider in 3rd on Saturday was Welch, MN’s Brian Childs, who was riding the only Kawasaki-based machine in the class, sporting a 750cc 2-stroke motor from the notorious mid-70s H2 sportbike – Childs carded a 6.770 second time in the first round. 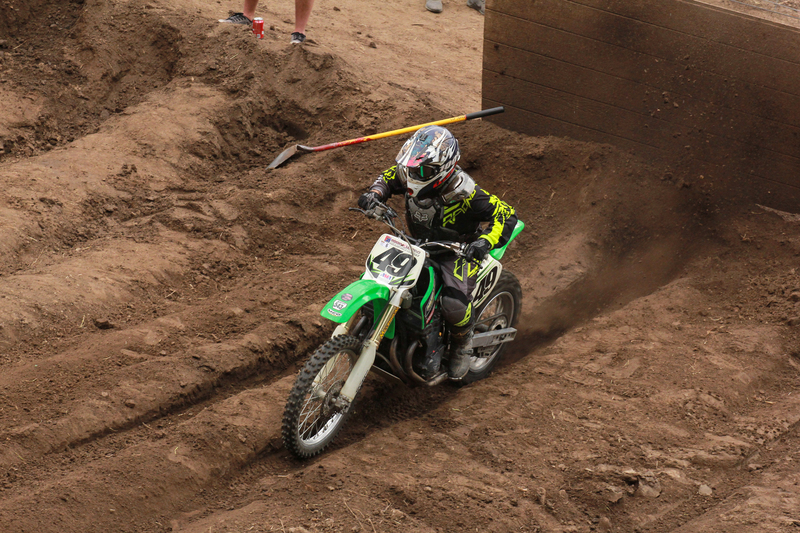 On Sunday, a few things were shuffled around…first, Slater took the aforementioned tumble in the ATV 450 class, but since he was in the lead after the first round he already had the option to wait until the end of the class to see if he needed to ride anyway. Thaxton squared up to the hill to try to take Slater down, but wound up with a broken chain, ending his ride at only 189 feet. Brian Childs hit the hill real hard after the first jump, casing the machine out and dragging the frame rails in the dirt…resulting in a disappointing 7.559 second time. No one else was able to make a serious threat on Slater’s lead…except for Zach Diercks, who was sitting about half a second off the leader. Diercks blasted the hill with a serious dose of heavily-modified Yamaha Banshee horsepower, the machine shrieking and bucking as the crowd watched the clock – he needed about half a second, and he got about half a second – but the “about” wasn’t quite enough, as the scoreboard showed 6.417 as Diercks sailed out of sight – Slater had won the class on a single ride by a mere 9 thousandths of a second, and didn’t need to ride again after all. So the class ended Slater – Diercks – Thaxton, with Childs in 4th and Jason Vanberg in 5th with a 6.878 as his best ride from the first round. The ATV Senior class, for riders at least 40 years old on any size ATV, attracted 5 entries, and this time it was Jimmy Thaxton’s turn to win a class on the first try – he punched through the top lights on his Yamaha at 6.779 seconds on Saturday, which would prove to be the winning ride. 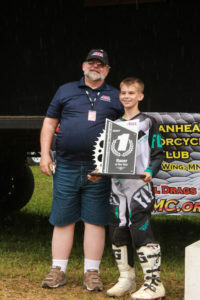 Dion Welch, from Hager City, WI, couldn’t quite get his Yamaha into the 6s on Saturday, but posted a 6.980 second ride on Sunday to take 2nd, and Dale Sack from Clarks Grove, MN claimed the final podium spot with a 7.906 Sunday ride on his Honda RC51-based machine. 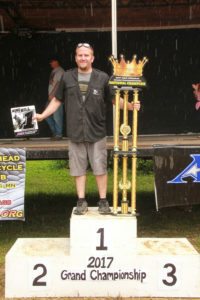 If there was a trophy for bad luck, Brian Childs would have won it in this class – a tossed chain on Saturday ended that ride at 190 feet, and on Sunday the chain got chucked again at only 90 feet – and actually hit Childs in the back as it reeled off the sprocket, apparently the first time anyone in the vicinity could actually remember a rider getting smacked with their own derailed chain. Although come to think of it, Paul Hillard of Bismarck, IL may have had worse luck…his machine blowing up before he even got a chance to ride at all, ironically earning a 5th place national trophy without having made a single attempt on the hill. Moving into the motorcycle classes, things got underway with the Micro Mini class – a class limited to 50cc minicycles, and riders from 4 to 8 years old. The 300’ hill must be daunting to a youngster on a tiny motorcycle, but about half the class made it to the top of the hill each day! After the first round, Logan Shafer of Caldwell, OH was in the top spot, having posted a 13.037 second ride on his KTM. Kaden Braun, of Sleepy Eye, MN was hot on his heels at 13.325 on one of only 2 Cobras in the class, with Beldenville, WI’s Charle Engnes being the only other rider to make it to the 13s with a 13.398. On Sunday, Braun would fail to improve his time, but held onto the 3rd place finish based on his first ride, while Shafer and Engnes both broke into the 12s – Shafer cut nearly a half-second off his time, improving to a 12.577, but the day (and the big trophy) would belong to Engnes, who improved his time by an amazing 1.2 seconds, carding a 12.169 on a nearly flawless straigtline assault on the hill on Sunday. So the top 3 awards went to Engnes, Shafer, and Braun respctively, with Brady Kirchner of Ellsworth, WI edging under the 14-second mark with a 13.905 for 4th place on his KTM, and Riley Bechel of Plum City, WI grabbing the 5th place trophy on his KTM at 14.971. Although it’s customary at nationals to pay trophies back to the top ten in each class, sometimes the hosting club will extend extra awards to the little guys – IMC proudly awarded medals to the 11th-21st place Micro Mini riders, who were equally proud to wear them and get their pictures taken! 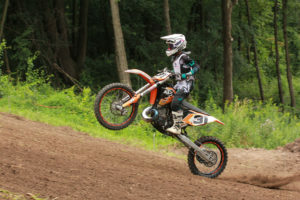 In the 65 class, Logan Shafer’s brother Conner fairly blew everyone’s doors off on Saturday, being the only rider to clock in at under ten seconds, with a masterful 9.973 second ride on his KTM. Lane Brookshaw of Ellsworth, WI was the only rider with a time in the 10s, posting a 10.524 on his Cobra that day. Braven Slater of Charleston, WV, Logan Shafer, and Charlie Engnes filled in the next three spots as the only riders to score in the 11s. 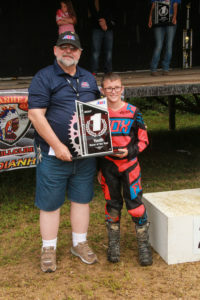 On Sunday, it was a repeat performance – Conner Shafer once again was the only rider in the 9s, proving his first round ride to be no fluke with an even-faster 9.931 second ride to convincingly claim the big trophy. Brookshaw once again was the only rider in the 10s, with a 10.270 second ride to preserve his hold on 2nd place, and Braven Slater took the final podium spot on his Kawasaki with an 11.212. Logan Shafer held onto 4th with a 11.493, and Engnes kept the 5th spot with an 11.956. Conner Shafer wasn’t done with his mini class dominance quite yet though…he pulled a similar victory in the Mini Junior class, sailing his Honda over the top of the hill with a blistering 8.467 second run on Saturday – clearly the class of the class, as no one else would get anywhere close to that time for the entire weekend! Only 2 other riders made it under the ten second mark, with Mason Sullivan of Hammond, WI posting a 9.107 second ride on his Suzuki on Saturday, followed by Lane Brookshaw’s 9.486 on his Kawasaki. On Sunday, the positions hadn’t changed – Shafer posted a 9.194, not even having to ride at all based on the first round results – Sullivan also failed to improve his time, and relied on his first-round time to take 2nd place, and Brookshaw also was slower in the second round, taking 3rd place based on his Saturday ride. Brady Kirchner would take the 4th place trophy with a 10.116 effort on his Suzuki, and Aiden Slater would take the 5th place trophy back to Charleston, WV with a 10.305 on his Kawasaki. While the Mini Junior class had a healthy 15 riders entered, the Mini Senior class had only 6 – but that doesn’t mean the racing was any less intense. 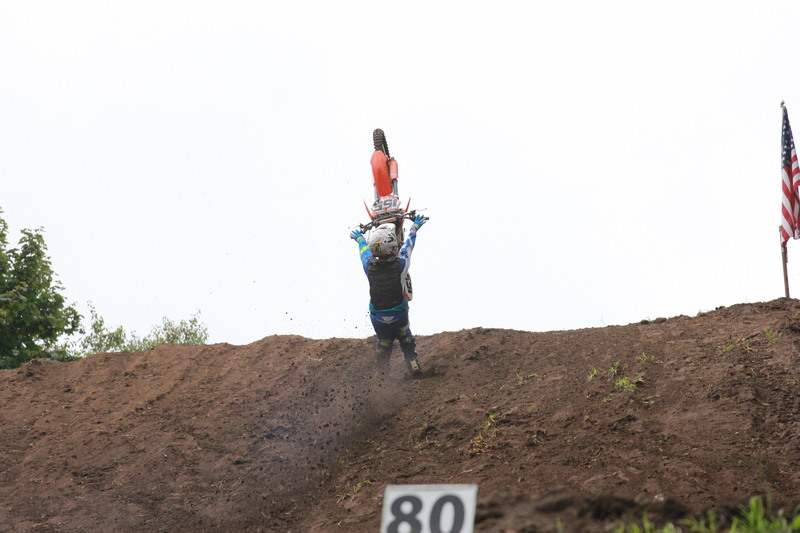 Carson Roschen, from nearby Goodhue, MN, laid down the law on Saturday with the only 8-second ride in the class, posting a 8.988 on his KTM, easily besting Anthony Engnes from Beldenville, WI who got his Suzuki through the lights at 9.664 seconds in the first round. After the first round, 3rd place belonged to Jayce Lester of Charleston, WV who clocked a 10.286 on his Kawasaki. On Sunday, Engnes would improve to a 9.357 – still a nice ride, but still 2nd place. Lester also improved nicely to a 9.875, holding onto 3rd place. Roschen would ride again even though he had the class locked up, and had some trouble on the hill the 2nd time around, failing to make it to the top, but winning based on his stellar first round effort. Clive Brookshaw, from Ellsworth, WI was eminently consistent, posting a 10.307 and then a 10.376 on his KTM to take 4th place, and Kyle Marty of Emerald, WI put his KTM through the lights at 10.984 in the first round, claming 5th place on that effort. If the Mini Senior class seemed light at only 6 riders, the Super Mini class was extra-light with only 4 entrants. This newer class, only having been offered for the past few years, may still need time to attract a full roster, but it did provide an opportunity for Carson Roschen to put an exclamation point on his Mini Senior class win – Roschen rocketed straight and true on his KTM, never letting the little tiddler drop off the pipe and nary a course correction in 300 feet to post an amazing 8.003 second ride on Saturday…frustratingly close to a 7-second ride! Kyle Marty would card a 9.034 on Saturday on his KTM, with Isaiah Dosdall of Hager City, WI putting his Honda through the top timer at 9.728 on Saturday, improving to 9.295 on Sunday. Roschen would add another 8 to his score sheet on Sunday, with an 8.634 – Marty had poor luck and failed to make the hill in the 2nd round, but still got the 2nd place trophy based on his 1st round result, with Dosdall claiming 3rd. 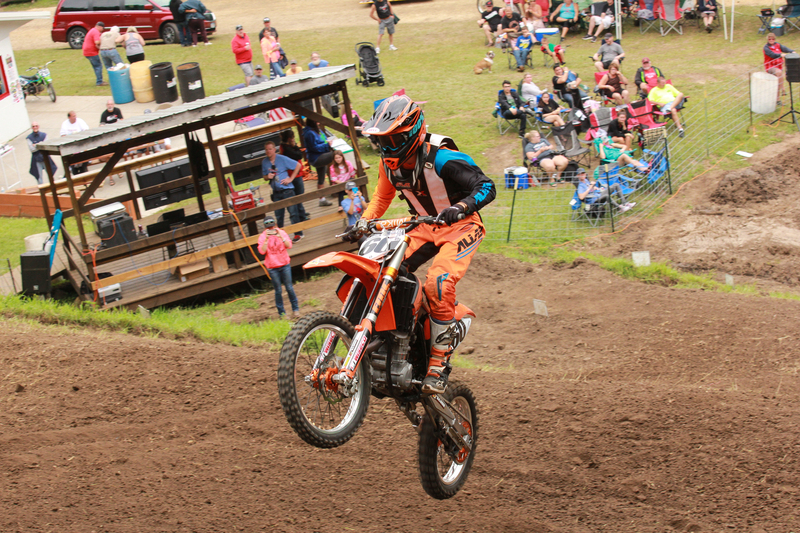 Damon Warwick, from New Ulm, MN, took home 4th on his KTM with a best effort of 10.413 on Saturday. Taylor O’Neil on his KTM – it was a good weekend for the O’Neil clan. 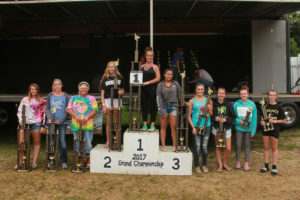 Also lightly attended was the Mini Girls class, which seems to fluctuate quite a bit from year to year…this year 5 girls from 5 states took aim and Kaly Mueller from La Valle, WI fired the winning shot on her little KTM, besting the class by an astonishing margin of almost 2 seconds! Her Saturday time of 12.737 was superb, and she’s clearly inherited her dad Kirk’s hillclimb gene. Of the other 4 competitors, only 2 more would see the top timing light…and in point of fact, Macy Jelinek of Hawley, MN was the only girl to do so on both rides (even Mueller had trouble on Sunday, and didn’t make it to the top), posting a consistent 14.586 in the first round and a 14.767 in the second round on her KTM to lock up 2nd place. Another member of the Jelinek clan, Kyleigh, from Fordville, ND would claim third place with a solid 15.654 effort on her Honda on Saturday – the Jelineks were out in full force thise weekend, with rosters full of brothers, sisters, cousins, and a bunch of their neighbors and friends – and in true Jelinek fashion they all acquitted themselves well! 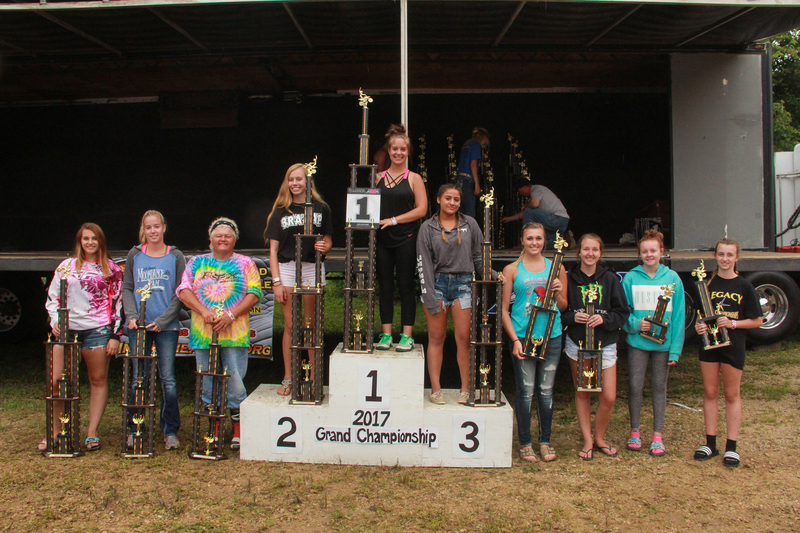 Fourth place went to Abigayle Linde of Charlton, MA on her Kawasaki, with 235 feet, and 5th place went to Khloe DeHart of Niles, MI on her KTM at 200 feet. Moving into the amateur classes, the 125 class saw some of the closest racing of the weekend, with only 3 tenths of a second covering the entire span from 1st to 5th place! At the end of Saturday, Hager City, WI’s Bodee O’Neil sat in first…barely…with a stellar 7.603 second time on his Kawasaki, with Carson Roschen hot on his heels with a 7.711 on his KTM – both riders pulling off seemingly perfect rides, keeping the tiny two-strokes on the pipe and straight as an arrow over the hill’s 3 formidible jumps. Ronny Vena of Johnstown, PA was the only other rider in the 7s in the first round, riding his Yamaha to the top a couple tenths behind at 7.970. Things tighted up considerably in the second round though, as Ellsworth, WI native Clive Brookshaw blasted his Yamaha over the top in 7.770 seconds, very nearly knocking Roschen out of 2nd place. Vena improved his time slightly to 7.857 seconds, and Colten Beckwith of Plattsmouth, NE joined the 7-second club with a 7.968. Roschen charged hard on his 2nd attempt, but was unable to improve his time, posting a 8.035 effort, leaving O’Neil with the win – although Bodee cranked out a 7.948 second ride just for fun. So it was O’Neil, Roschen, and Brookshaw on the podium in that order, followed by Vean and Beckwith for the top 5 – no one else made it out of the 8s. The 200 class is kind of an interesting one these days, as a rule change a few years ago allowed the modern 250cc 4-stroke machines to compete in this class, taking a 50cc handicap against 200cc 2-strokes. Generally it seems to be a pretty fair fight, and this year there would be 2 2-strokes on top of the class, and 3 in the top 5. 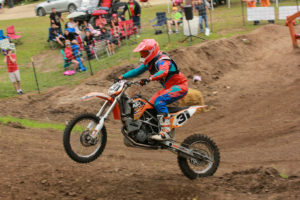 A trio of riders made it into the 6s on Saturday, let by Bodee O’Neil who carded an incredible 6.634 second ride on his KTM in yet another seemingly flawless attempt as he continued his fantastic weekend. Nathan Prebe, of Frontenac, MN would be just a couple tenths out of the lead, sailing his KTM through the lights at 6.876. One other rider would hit the 6s on Saturday – Jason Laven, of North Mankato, MN pushed the 3rd KTM 200 through the lights at 6.983 that day. On Sunday, O’Neil once again sat in the captain’s chair, waiting to see if anyone could best his first round time… Ronny Vena would charge into the 3rd place position with an excellent 6.964 on his Husqvarna, with Laven failing to improve his time and falling to 4th. Prebe also was unable to mount a successful assault on the lead, carding a 7.0 in the 2nd round, leaving O’Neil with the class wrapped up once again with his 1st-round ride – although he did ride again and punctuated his victory with a 6.667 – which also would have won the class if not for his faster Saturday run. Max Skeans from Ashland, KY would make it to 5th place with a respectable 7.229 on his Kawasaki. O’Neil and Prebe traded blows again in the hotly-contested 250 class, which would end up with the top 7 riders all with 6-second times. Prebe powered his Honda through the lights on Saturday with an excellent 6.395 second effort, only to see O’Neil blast his KTM over the top 8 hundreths of a second faster at 6.318, taking the lead into the 2nd round with Zach Degross of Ellsworth, WI posting a 6.573 on his KTM, Steve Cain of Bellevue, NE running a 6.677 on his Yamaha, and Jared Marty from Elmwood, WI being the last rider in the 6s on Saturday with a 6.828 on his Honda. So for the 3rd time on the weekend, O’Neil enjoyed the luxury of sitting back and seeing if anyone could wrest the lead from his grasp…Degross would post a consistent 6.596 and retain the 3rd place position, and Cain held 4th down after posting a 6.940. Braiden Henry from Mankato, MN would sneak into the top 5 though, displacing Marty with a 6.706 second blast on his Honda. Finally, Prebe posted a fast-but-not-fast-enough 6.488 in the 2nd round, giving the class win to O’Neil – who went ahead and cranked out a 6.247 to extend his margin of victory just a smidge. Truly a banner day for Bodee! Bodee wasn’t the only O’Neil hunting for gold this weekend though…brother Taylor, also from Hager City, WI, ended the 1st round in charge of the 450 class with a masterful 6.321 second ride on his KTM, just a bit ahead of Nathan Prebe who once again found himself barely out of the lead, this time with a 6.389 on his Honda. In this class, every rider in the top 15 (with 53 riders total in the class – the biggest of the weekend) would post 6-second times. So on Sunday it was Taylor’s turn to watch and wait as rider after rider blasted a series of 6-second rides as they tried to bump him off the top – in the end, when the dust settled, Taylor’s 1st round time still stood as the class of the class, with Prebe failing to improve with a 6.594 second attempt on Sunday, followed by Braiden Henry on his Yamaha who took 3rd place by virtue of his 6.392 second effort on Saturday. Ronny Vena, ever-consistent with a 3.396 on Saturday and a 6.400 on Sunday claimed the 4th place trophy, with Zach Degross succumbing to the hill in the 2nd round with only 180 feet, but taking the 5th place award with his first-round 6.413 on his Yamaha. Less than a tenth of a second covered the entire spread from first to fifth! The 600 class was also huge, with 51 entrants vying for the coveted national title…in this class though, one rider simply took everyone else to school. Honda-mounted Zach Degross was the only rider to bust into the 5s, with a mind-blowing 5.953 moonshot on Saturday. Ellsworth, WI’s Jason Brookshaw was frustratingly close though, rocketing his Honda over the top like a moonshot with a 6.075, followed by a plethora of other riders all carding 6-second times in the first round. On Sunday, many riders were able to significantly improve their standings, with Jon Henderson from Ashland, NE piloting his wailing Suzuki GSX-R 600 to a 6.018, and Logan Peterson from River Falls, WI bettering his time by about 3 tenths to a 6.041 on his Kawasaki to move into 3rd. Taylor O’Neil served up another excellent ride on his KTM, launching over the top with a 6.044 to take 4th, while Brookshaw was unable to better his score, carding a 6.849 while slipping to 5th place. Degross, with the class win in hand, went ahead and delivered a knockout blow with a seemingly impossible 5.793 second ride on Sunday, having his CR500 wound tight, fast & low over the jumps and continuously accelerating all the way over the crest of the hill – a flawless victory. Mueller’s mind-blowing time – truly in a class of his own! The 750 class saw 5 Kakasaki H2 2-stroke triples fielded, and it seemed to be a foregone conclusion that one of those potent machines would claim victory in the class, on a hill that seemed to be favorable to that type of bike. Things certainly started out that way, with Kirk Mueller of LaValle, WI, whose daughter Kaly was leading the Mini Girls class at the time, clocking a 6.415 second ride on his shrieking triple in the first round, narrowly edging yours truly, Kaleb Northrup of Hastings, MN into 2nd with a 6.472 second ride on my own triple. Travis Schroedl, from Fairfax, MN, on the only single-cylinder machine in the class, posted a 6.811 second ride on his KTM, a hair ahead of Cody Raines of Prestonsburg, KY and his Suzuki GSX-R. On Sunday, Mueller was unable to improve, carding a 6.633, and while Raines did better his time to a 6.692, he remained in 4th place – but Schroedl managed to find some extra speed in his machine, and blasted his way into the lead with an impressive 6.366 second ride on Sunday. Although Nick Bronnenberg of Perry, IA made his way into the 6s in the second round, taking 5th place with his Kawasaki triple at 6.788 seconds, no one could catch Schroedl – including myself. Despite gearing my triple up and applying an injudicious amount of throttle, I still came up a bit short at 6.392 – three hundredths of a second seperating me from Schroedl and the big trophy. So at the end of the day, it was Schroedl, Northrup, Mueller, Raines, and Bronnenberg in the top 5. The Open class laid down some blistering times over the weekend, and provided for a great come-from-behind victory… At the end of Saturday’s program, Lake City, MN’s Bradley Marking was in the top spot with a superb 6.051 second ride on his big Kawasaki KZ, wringing the howling machine for all it was worth as he launched the successive jumps while staying straight and true. The only other rider even close to Marking was Logan Peterson and his Aprilia, the only Italian machine at the event – Peterson blasted the big v-twin over the top at 6.118 seconds in the first round. Several other riders were in the 6s on Saturday… On Sunday though, as Marking was hoping to be able to just sit the class out with no one besting his time, Kirk Mueller lined up his big Suzuki GSX-R and did what very, very few people had done this weekend – he broke the 6-second barrier, the irresistable force of the superbike motor catapulting him over the top in 5.956 seconds, bumping Marking into 2nd place by just a hair less than a tenth of a second. Jon Henderson punched his way into 4th place with a 6.498 second effort on Sunday, and Arnold Jelinek from Hawley, MN wrangled his 4-cylinder Honda into 5th with a 6.499. When it came time for Marking to ride, luck was not on his side, and a mechanical issue ended his attempt at only 180 feet…leaving him in second, and Mueller with a fantastic victory from out of nowhere, having had trouble himself on Saturday with a 112 foot ride. The Women’s class, with Casey Virkus at the top. The Senior class attracted 25 entries, and turned out to be a very fast class – don’t let the name of the class fool you – some of these old guys are fast! 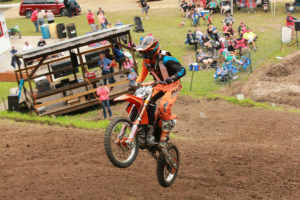 Joel Falde of Ellsworth, WI, and one of the youngest old guys, swung for the fences on his first ride on his KTM v-twin, blowing through the top lights at 6.183 on Saturday. Jason Brookshaw on his CR500 went straight for Falde, and put up a smokin’ 6.213 on his first ride. A bunch of other riders were also in the 6s, including Corey O’Neil (Taylor and Bodee’s dad), Todd Cipala of Ellsworth, WI (a multiple time former national champion) and Mike Wood of Bay City, WI – also a multiple time former national champion. On Sunday, a few things shuffled around…Jason Northrup of Hutchinson, MN put his giant Kawasaki KZ onto the podium with a 6.205 second ride, which was a full second faster than his Saturday attempt. Cipala bettered his time to a 6.307, which looked probably good for 4th, but slipped to 5th when I launched myself on my Kawasaki triple through the top timers at 6.294 – a time that would have one the 750 class, on the same bike. As for the top two riders, Brookshaw posted a 6.138 second time…which would have nicely brought home the gold, if it wasn’t for Falde cranking out just a little bit more on the roaring KTM, blowing through the jumps and lauching over the top at 6.056 seconds for the class win. The Super Senior class requires that riders be at least 50 years old…but again, don’t assume there won’t be any fast times in that class…Mike Wood was the class of the class, turning two 6.3 second times to claim victory on his Honda CR500 – a 6.392 on Saturday and a 6.313 on Sunday. Todd Cipala was similarly consistent with a 6.644 and a 6.648, claiming 2nd place on his big v-twin Buell. And from Fleming, OH, Les Wolfe put his CR500 over the top in 6.831 seconds on Sunday to take the final podium position, edging out Micheal Pulver of Lizton, IN and his Honda by just a smidge – Pulver posted a 6.883 on Sunday. Tim Cain would get the 5th place trophy by virtue of his 7.211 second time on Saturday – unfortunately Cain was unable to ride in this class on Sunday, having crashed in the 600 class and breaking his leg. Tim’s doing fine though, and will be back on his feet in no time. 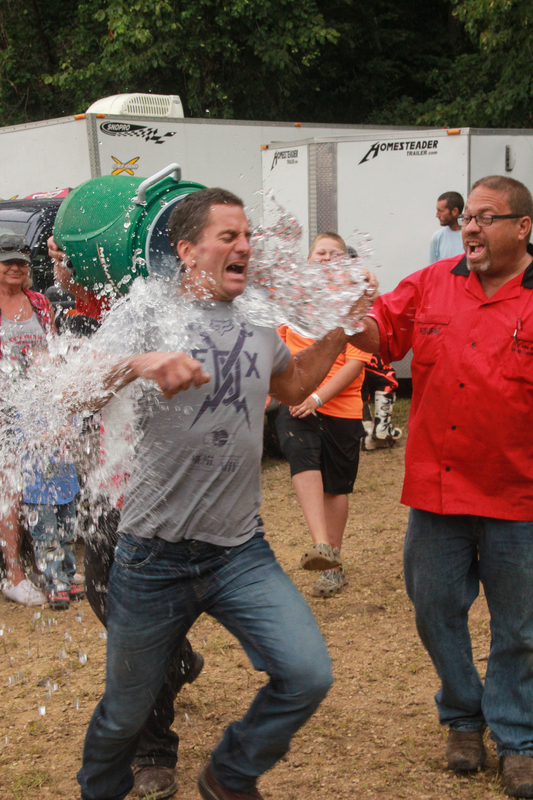 IMC club president Brian Marking watches as Jason Brookshaw gets an ice-water bath. The Women’s class also unfortunately was witness to a significant injury – Morgan Roschen of Goodhue, MN, determined to improve her 11.417 from Saturday, attacked the hill much harder on Sunday, improving her time by an incredible ~3 seconds, but lost control of her machine over the top and wound up with a broken arm. After a quick trip to the hospital, Morgan was patched up and she’ll be right as rain in a couple months. Back to the leaderboard though…Casey Virkus of Ellsworth, WI was the only woman to hit the 6s all weekend, expertly blasting her Honda CR250 through the jumps and over the top in 6.789 seconds on Saturday, and 6.842 seconds on Sunday – ultimately winning the class by nearly a second. Marlee Funk of Wayland, MI, who celebrated her 14th birthday on Saturday, displayed great consistency with a 7.753 and a 7.748 on her Honda, taking home the 2nd place trophy. Incredibly, Hager City, WI’s Madison Welch posted an identical 7.748 second ride on her Honda as her best attempt – the same time as Funk. The tie is them broken by comparing the riders’ second-best times – with Funk’s 7.753 in the first round being better than Welch’s 8.020, relegating Madison to third. 4th place went to a remarkably consistent Keara Finkbeiner or Caledonia, MI, who turned a 7.933 and a 7.926 on her Yamaha – only seven thousandths of a second differentiating her two rides! No other riders got into the 7s, but Katie Bohn from Park River, ND got her Honda over the top in 8.380 seconds on Sunday to claim the 5th place trophy. The 400 Stock class went down to the wire between Jacob Prebe of Millvile, MN and Jared Marty of Elmwood, WI – on Saturday, Marty put his KTM into the top slot with an excellent 7.459 time, with Prebe a tick behind with a 7.540. On Sunday though, Prebe would find just a touch more speed in his Kawasaki, and flew over the top with a 7.397 to take the lead – Marty had issues immediately on his second ride, which ended at only 80 feet, leaving him in 2nd. More than half a second off Marty’s time was Jeff Jack from Wapello, IA, who took home the 3rd place trophy with an 8.094 on his KTM, closely followed by Micheal Pulver in 4th on his Kawasaki, who posted an 8.187. 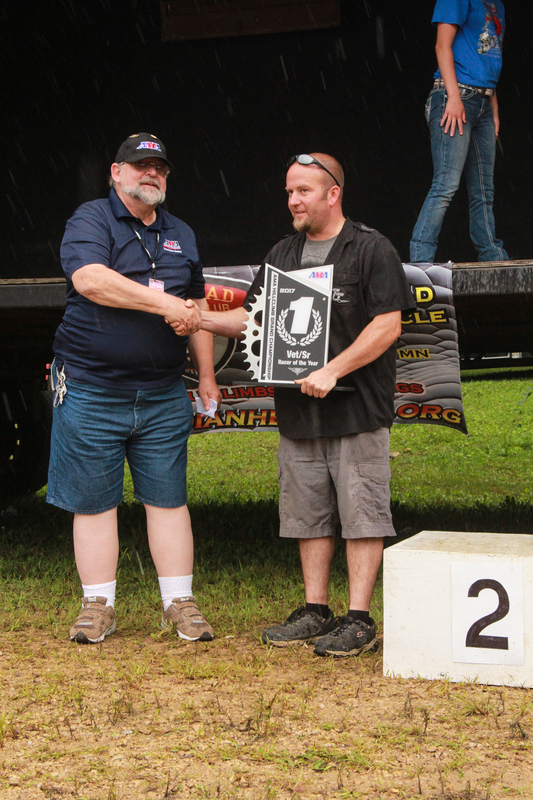 Rounding out the top 5 was Ethan Wolfe from Little Hocking, OH, who got his Yamaha to the top in 8.593 seconds. The Verticross class – Jason Braun, Luke Cipala, and Jacob Prebe. While the 400 Stock class was a bit of a dogfight between the top 2 riders, the Open Stock class got blown out by Max Skeans of Ashland, KY…Skeans got his Yamaha through the lights at 7.605 on Saturday…a respectable ride, but not spectacular. Mark Nielsen from Ellsworth, WI sat in 2nd with a 7.919, and no other riders made it under 8 seconds in the 1st round. On Sunday though, Skeans pulled out a nearly unbelievable ride on a stock bike, managing to keep his momentum up on the unextended bike vastly better than anyone else that weekend, and carded an astonishing 6.731 second time! Henry Kelley, of Faribault, MN would claim 2nd place with a 7.851 second-round ride on his Kawasaki, relegating Nielsen to 3rd on his Honda. Jeff Jack just missed the podium with a, 8.171 on his Husqvarna for 4th place, and once again Ethan Wolfe claimed the 5th place award on his Yamaha at 8.265 seconds. In the popular 2-Stroke class, the top 16 riders all came in under 7 seconds, creating a lot of competition for the trophy spots…but no one could compete with Jason Brookshaw, who was the solitary rider in the 5s – Brookshaw seared the hill with a perfect ride on Saturday at 5.925 seconds on his Honda, and was able to sit and watch all day Sunday to see if anyone could match it…and no one could. Logan Peterson was frustratingly close though, flying his Kawasaki through the timers at 6.001 seconds on Sunday…something like 8 hundredths of a second away from the win. Zach Degross took his best shot on Saturday, posting a 6.086 that had him in 2nd after the first round, but he was unable to improve his time on Sunday and fell to third. Matt Altfillisch of Elizabeth, IL was a couple tenths back on his Kawasaki, with a 6.228 seocond effort that earned him the 4th spot, and Hager City, WI’s Tyler Johnson rode his Honda to 5th place with a solid 6.250 second time on Sunday. 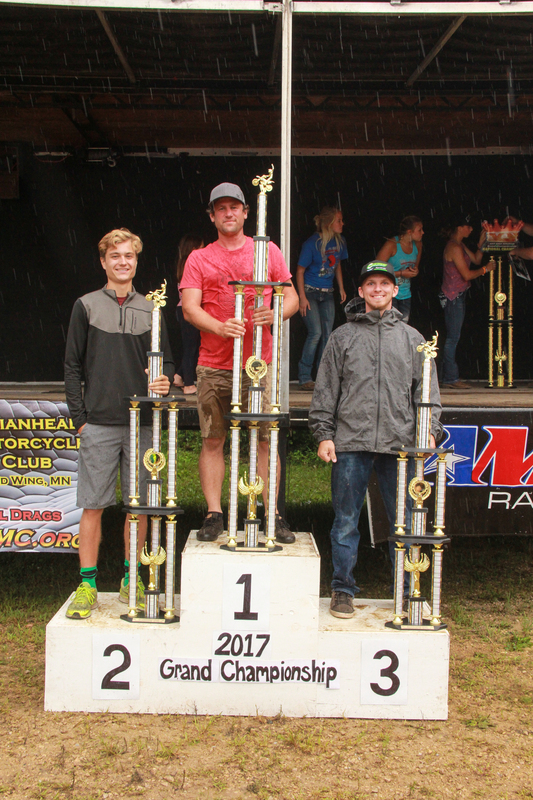 Nathan Prebe claimed the big trophy in the 4-Stroke class on his Honda by virtue of his 6.101 first-round ride, ever-so-slightly faster than Luke Cipala of Ellsworth, WI whose 6.172 on Saturday was also his best effort. Nathan’s brother Aaron, also of Frontenac, put down a great 6.255 on his Honda in the first round that would see him to the 3rd place trophy, with Corey O’Neil a couple ticks back at 6.433 on his KTM for 4th. Fifth place in the hotly-contested class went to Bradley Marking and his Yamaha, with a 6.445 second time on Sunday – one of few riders to actually improve his time in the second round. For the first time ever at a national championship, Indianhead M/C opted to offer a Verticross class – similar to hill drags, but a newer format, Verticross is run as a series of head-to-head matches with 2 riders battling at a time on the hill. 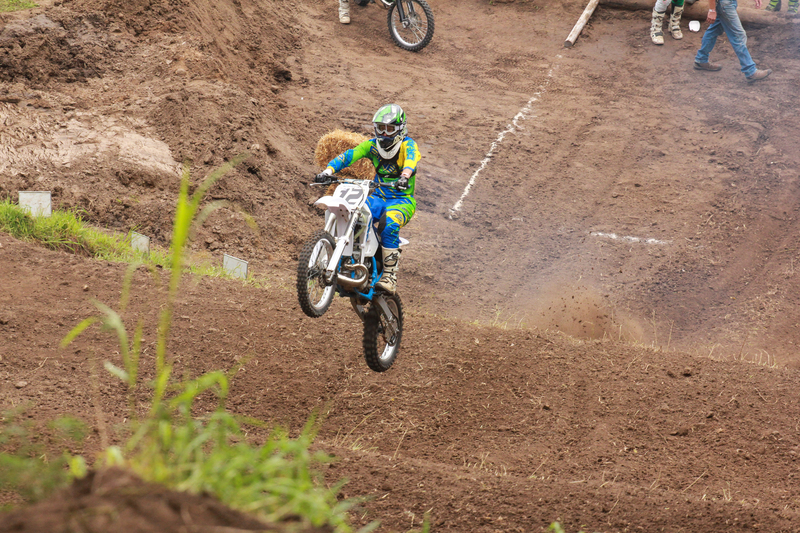 This sport starts in a motocross-style gate, with the riders having to race side-by-side over the jumps and also through gates and around flags, requiring several direction changes – which isn’t as easy as it sounds on an extended bike on the side of a hill! 29 riders competed in the double-elimination bracket – once you lost your first match, you’d drop to the losers’ bracket, where every match was sudden death…lose for a second time, and you park your bike. 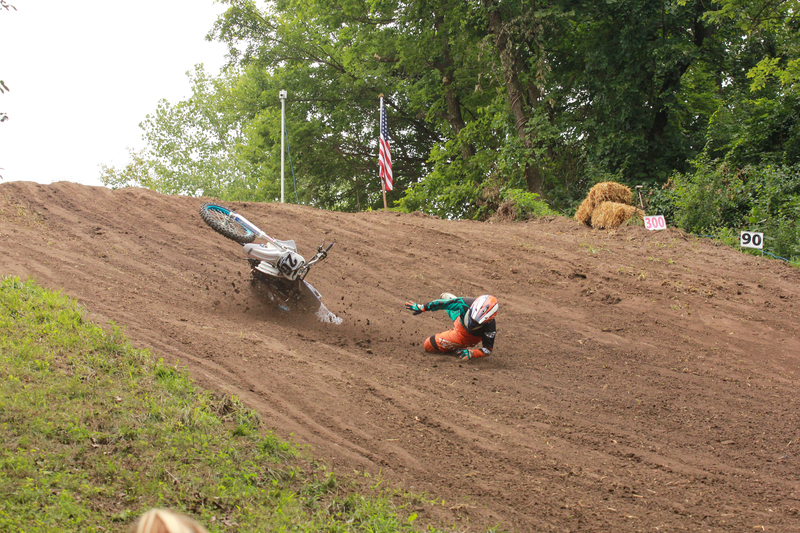 So Saturday after the main program, the Verticross got underway but a safety issue immediately reared it’s head…of the first 3 riders in the right lane, two of them were tossed over the front of their bikes, and the third just barely managed to land and continue. IMC officials stopped the event and Jason Brookshaw, the club’s masterful Bobcat operator, quickly and efficiently reshaped the first jump to make the course safe and fair. The Verticross was then restarted, and ran smoothly from there on…with some intense competition! The first 200 feet or so were straight up the hill, over the first couple jumps but a little rougher than the main hill – frequently the rider who made it through that section first would allow the other rider to catch up trying to cross the hill through the gates after the 3rd jump, and many matches were won by the trailing rider being able to pick a better line and overtake the leader on the very last segment of the course. As the bracket continued, Luke Cipala was clearly dominating the Winners’ bracket, along with Jacob Prebe…and Jason Braun from Sleepy Eye, MN was cleaning up in the Losers’ bracket, having lost a match but continuing to dispacth every rider he met thereafter. As the bracket was coming to a close, Braun would send Prebe packing in the penultimate matchup, and as the last man standing from the Losers’ bracket, he faced the daunting challenge of having to beat Cipala twice – remember, this is a double-elimination event, so beating Cipala once wouldn’t do it – Braun would have to defeat the undefeated Cipala twice in a row. Which is precisely what he did! 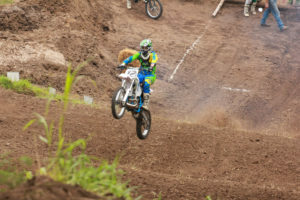 Braun had proven thoughout the day that no one could navigate the final 90-degree corner just above the 3rd jump the way he could, as he would straighten his Kawasaki and immediately get back on the boost every time…and every time he got to that section of the hill (after his first loss), he would outmaneuver his opponent and take the victory at the top. As you might guess with these two talented riders, both races were tight and exciting – but Braun managed to pull off the two-in-a-row win, taking the win in style to the great approval of the crowd, with Cipala having to settle for 2nd place after dominating all day long. 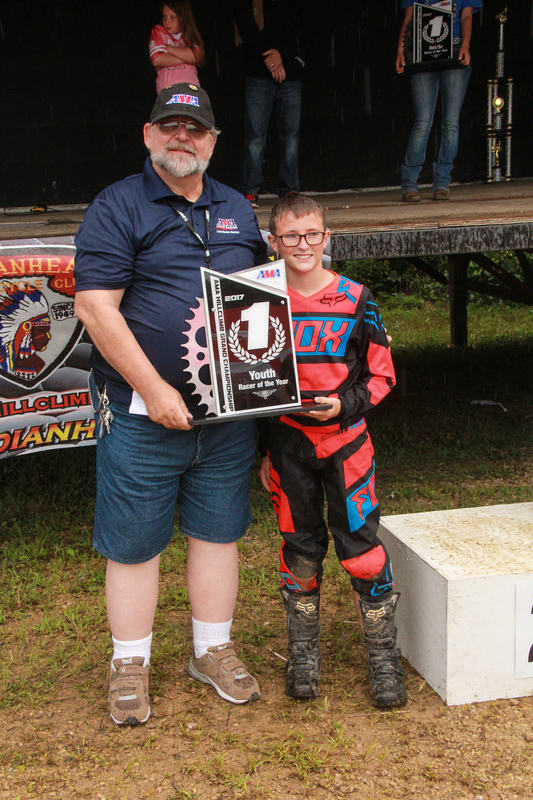 On Sunday, as has become tradition now at nationals for the past many years, IMC ran a King of the Hill class that pitted the top 10 riders from each lane in a one-run shootout for a single trophy…to prove who truly was the King of the Hill. So the best of the best lined up for one more shot, each rider blasting incredible rides…Nathan Prebe threw down a 6.041 on his Honda, Logan Peterson ran a 6.075 on his Kawasaki, Mike Wood was at 6.085 on his Honda…and Jason Brookshaw who qualified in with a 5.925 on his Honda from the 2-stroke class blistered the hill one more time with a 5.987. But the man of the hour, the one true King of the Hill would be Kirk Mueller. Mueller calmly punched the starter button on his Suzuki GSX-R Open class machine and eyed the hill – Kirk doesn’t waste much time in the hole. In came the clutch, shifted it into gear, and then the massive Suzook exploded through the first timer with a fury that hadn’t been seen all weekend…and Mueller kept the throttle pinned as he blew through the jumps like they weren’t even there, flying off the top of the hill as if launched from an aircraft carrier and posting a mind-blowing 5.588 second time! Previously no one had gone any faster than a 5.7 – to beat that by another 2 tenths was just absurd. Mueller blew the class away, leaving absolutely no doubt as to who was the King. At the award ceremony, the AMA haded out three titles to the weekend’s standout riders in three different categories. 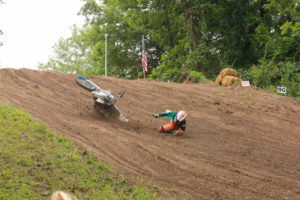 The AMA Youth Hillclimber of the Year went to Carson Roschen, who was chosen in an agonizing decision over Conner Shafer with the AMA officials deliberating for some time – both riders had superb weekends! The AMA Vet/Senior Hillclimber of the year was Kirk Mueller, who as noted just above was also the King of the Hill and set the incredible fastest time of the weekend. And the AMA Hillclimber of the Year was Bodee O’Neil who managed to win the 125, 200, and 250 classes! Kirk Mueller, the 2017 King of the Hill National Champion! Congratulations to everyone who came out and competed, and on behalf of Indianhead M/C, THANK YOU to all the riders, families, friends, and spectators who made this event a fantastic success! Click here for the full results!